"Wishing all Keralites A Very Happy Onam"
Hope u all are fine and enthusiastic in your spaces.Am very sorry about my sudden absence from the blogosphere. Actually,I was quite busy in the last couple of days with the school re-opening,my laptop was down with some issues and so couldn't update any posts neither could I visit your spaces or leave comments then it was our wedding anniversary celebrations and followed by Onam.Thanx to all my close friends in blogging who dropped me a line through mail and messages,checked if everything was fine at my side.Love you all dearies for the sweet thought.A big bunch of thanx to everyone who visited my space during my absence and cheered me up to join blogging soon.And so friends am back with all zeal and enthusiasm.Will try & get back to your spaces soon,do drop by my space too as always !! Today is Onam ,a festival celebrated by all people in Kerala.The festival commemorates the Vamana avatar of Vishnu and the subsequent home coming of Emperor Mahabali.The festival is marked by various festivities,﻿including intricate flower carpets(athappoo),elaborate banquet lunches,pulikali,snake boat races etc.Not going much to the details of Onam,we just had a wonderful lunch with all dishes,kids really enjoyed it.Ada pradhaman is one of the important kheer/payasam served in the banquet lunch.So,sharing the recipe with you all with the home made ada.Stay tuned for the homemade ada recipe,Coming next !! -Heat the ghee in a pan and fry the cashews slightly brown ,then remove in a plate. -Add the raisins and fry it.Then,remove on a plate.Add the ada and saute till slightly done. -In the mean time,heat jaggery in 1 cup water and melt it.Starin and remove impurities. 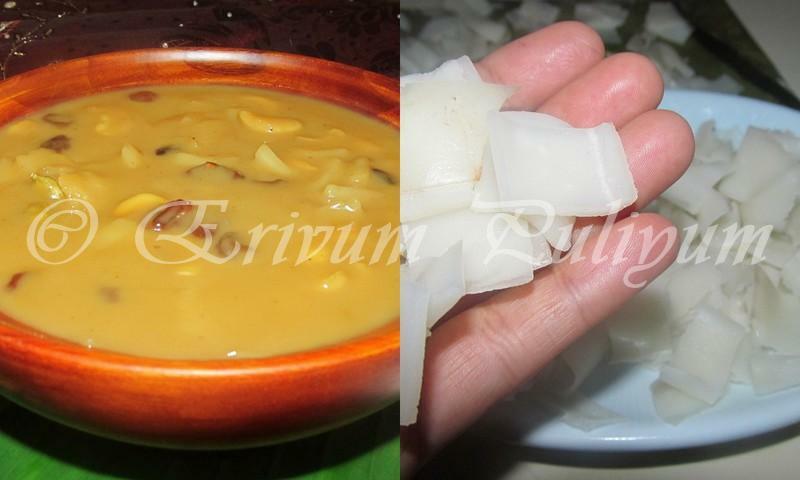 -Add the strained jaggery to the ada and thin coconut milk.Let it cook on medium flame upto 20 minutes stirring frequently until it thickens slightly. -Add the fried cashews,raisins,dry ginger powder,cardamom powder. -Lower the flame and add thick coconut milk.Wait till one or two bubbles appear at the surface. -Put off flame and serve warm !! * You can use store brought ada or the home made ones.Home made ada yields more softer ada. * Use the dark colored jaggery for a nice color. * I have used the canned coconut milk.To make thin coconut milk ,dilute with water,use 1:1 or 1:2 ratio depending on the thickness.You can also use maggi coconut milk powder or squeeze milk from shredded coconut. 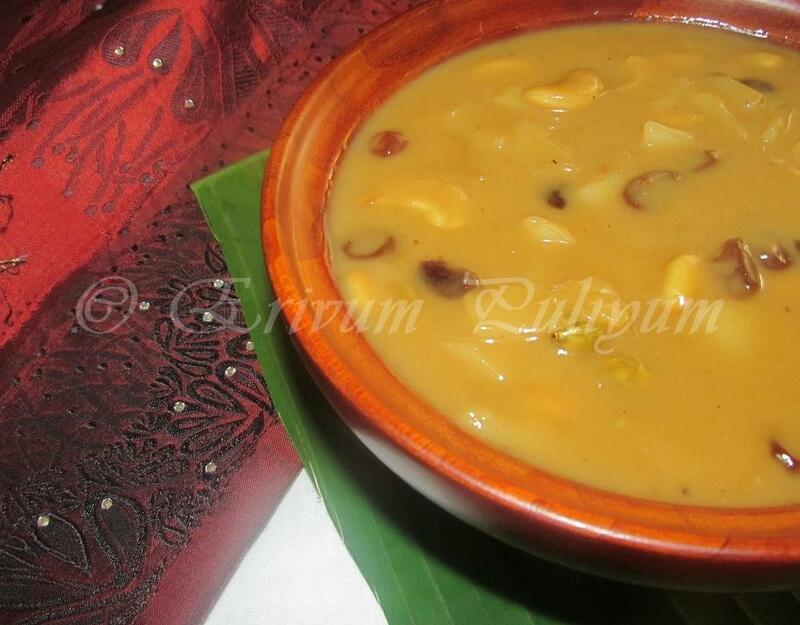 * Ada pradhaman tends to thicken on cooling,so put off flame when slightly watery. i am seeing diffrent type of rice flakes .. very Delicious and nice colour of kheer . OMG! what a lovely and fabulous kheer! Looks divine. yeh Julie, I missed you a lot in these days. Was thinking to mail you, but couldnot. Happy onam dear. Your two sons are too cute, very happy to see, both of them. what a lovely spread, give us the recipe how ada is Home-made, and the kids with their yummy spread look so adorable.., That is one beautiful click, your little one knows the priority food or photo.., I think I would choose the gorgeous spread in front of me :)).., sorry for the long comment.., Just smiling at your little ones.., Happy onam to you dear and to your family.. I have fallen in love with this sweet ever since I ate it in COCONUT GROVE .. will try it out now that I have the recipe. Nicely done, Julie. Happy Onam to you and your family. Happy Onam...the kheer makes me mouthwatering! Delicious ada pradhaman Julie, Looks like wonderful spread. Happy onam to you and your family. Your sons looks cute. 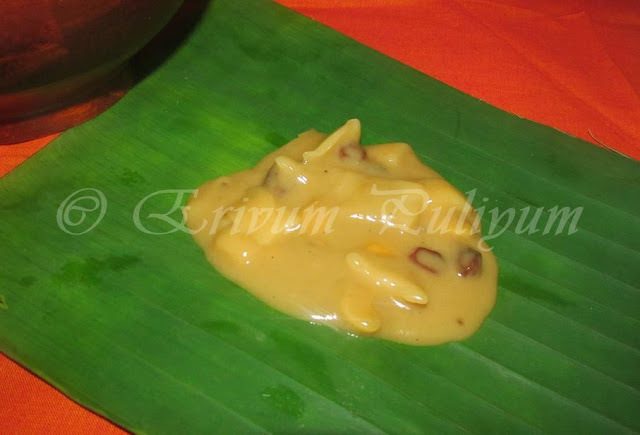 Ada Payasam looks really delicious, yummy prep. Kids pic is so adorable Julie, ur little one is sitting so cool n having Sadya, just lovely. Hope you guys had a wonderful Onam :) Onam Wishes Agian!! Thanks for linking to my event dear.. Please do add the logo as it helps to spread the word. Wish you a Belated Happy Onam! Happy Onam to you too! Love your traditional way of serving! Please explain what is Jaggery. Happy onam Julie!!! Love this Ada pradaman. In Kanyakumari Dist of Tamilnadu we gets only maida(plain flour) ada. So for us ada pradaman means its maida ada pradaman. Do you make ada pradaman using maida ada???? Want to join with your kids to have some..... he..he..he.. Happy Onam. I love ada pradhaman. Looks like the boys are enjoying the feast. Happy Onam Julie!! That payasam looks so delicious!!! Wow ada pradhaman looks os stunningly yummy and the lunch spread wow I just need a treat like this :) Awesome!!! Happy onam wishes Julie, ada pradhaman looks absolutely irresistible..Love ur onam sadya, beautifully done. Happy Wedding anniversary dear! That looks so yummy! Nice to see you back Blogging Julie, missed you! happy onam! kheer looks delicious. cute kids! This is such a beautiful way to celebrate this festival! Beautiful exotic flavors!I am sure everyone enjoyed it! jaggery is a traditional unrefined non centrifuged whole cane sugar consumed in Asia;a concentrated product of cane juice without separation of molasses and crystals,and can vary from golden brown to dark brown in color.Its available in most Indian grocery stores. Happy Onam.Yummy kheer. I missed it. lovely spread Julie...and please introduce those 2 little tykes! they are sooooo cute! I am gonna post the round-up of the event, as per the rules of the event I wont be able to add your post in the round-up without the logo.